*Suitable for shower bath installation, double holes unfold Install. *single handle independent switch. automatic mix cartridge. *Ceramic cartridge, Quality guarantee time:5 years no leakage. 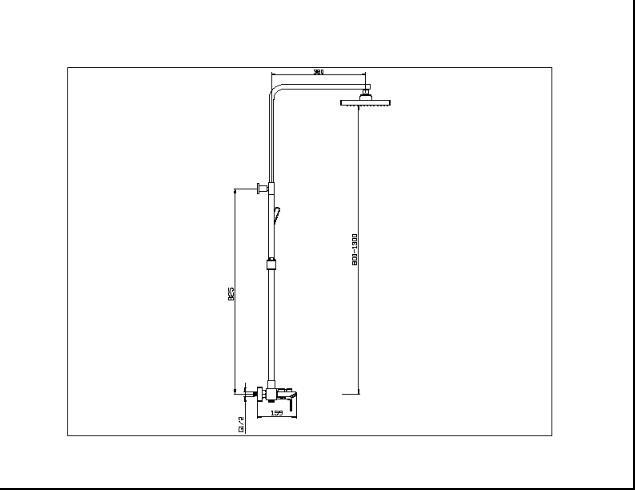 *The product has three functions giving water(A. faucet, B. top shower, C. hand shower) .The functions giving water is controlled by a three-in-one diverter , easy to operate and have superior performance. *High purity brass main body, with 8 inch (20cm) ABS (engineering plastics) top shower. swing smoothly. Soft silicone water particle easy to cleaning scale, flow uniformity. *Slide shower bracket up and down smoothly and can be rotated multi-angled . *With 1.5m stainless steel flexible hose and single function hand shower. *Using high quality materials ABS( engineering plastics) ,chrome plated. 5)The distance of the embed cold and hot water pipe joint center is 150 ± 20mm.